Megalytic provides client reports and dashboards that make your agency look good. Megalytic is a client reporting and dashboard tool used by digital marketing agencies and website hosting companies. We make it easy for busy people to create great looking reports that clients love. Megalytic automates the tedious, repetitive work of monthly reporting. Your clients receive timely and useful reports that make you look good. With Megalytic, there's no need to study a manual to get started. With just a few clicks, you can create reports and dashboards that will impress your clients. Let us know if you want a demo. We can train your whole team in minutes. Megalytic connects to the marketing data that matters to you and your clients. It only take a couple of clicks to authorize access to Google Analytics, Adwords, Bing Ads, Search Console, Facebook Pages, Facebook Ads, and more. More data sources are being integrated all the time. 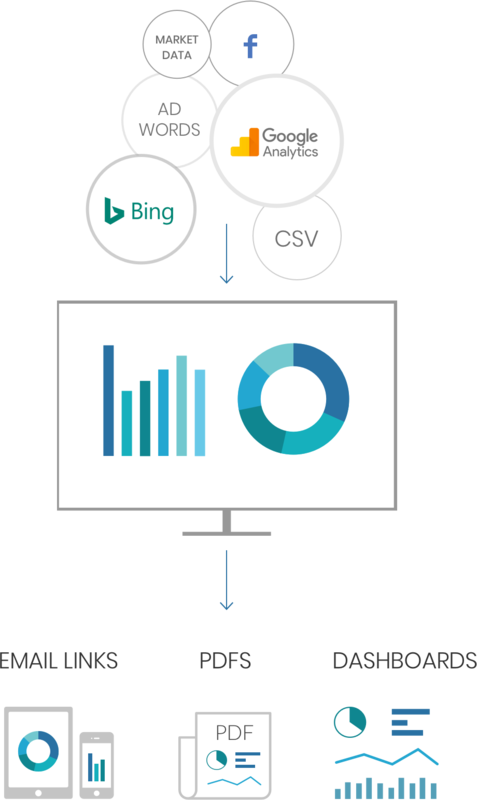 Plus, you can upload CSV data from any source. Or even host data in a Google Sheet and pull it right into Megalytic. Anybody can create awesome reports with Megalytic. To get started, we have built-in templates for common reporting requirements like SEO, PPC, Facebook, etc. Just plus in your data and have your first report finished in minutes. Next, edit our templates to match your own brand. Tweak charts. Modify dates. Adjust colors, logos, and fonts. Add text and cover pages to personalize reports for each specific client. Whatever format you and your clients want, Megalytic delivers. Email reports as PDFs; share them as links; or publish data in dashboards. Reports can be scheduled to deliver monthly, weekly, or whenever you want. Create email lists to manage who receives your reports. Data is updated automatically, so you don't need to worry about refreshing report data every month. Megalytic removes the grunt work for fully automated client reporting. So, you can focus on delivering results for your client. With over 70 reports monthly, Megalytic is a lifesaver. The reports are professional, and the selection of widgets is extensive. Plus, the customer service is always excellent, with questions answered promptly. "Megalytic takes the repetition out of reporting and allows us to focus on the most important thing, producing valuable insight for our clients!" "The widgets are great. Megalytic lets me knock out reports for my clients in 15 minutes so we’re no longer struggling to get our monthlies out."